Services were held at 10:30 a.m. today at Denton-Wood Funeral Home in Carlsbad for Edna Jenks Hedin. 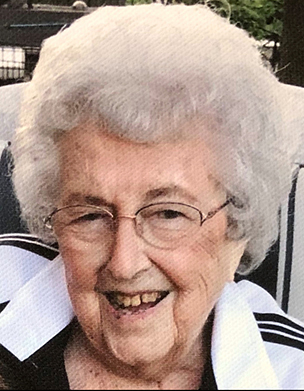 Hedin, 94, passed away Monday, Jan. 28, 2019. Interment followed the services at Twin Oaks Memorial Park. Edna was born Nov. 15, 1924, in Ft. Worth, Texas, to Edward Lee and Tressie (Jackson) Jenks. Shortly after her birth, her family moved to Purcell, Okla. She graduated from Quinton High School in 1943 and entered Central College in Conway, Ark. In the fall of 1945, Edna enrolled in Oklahoma Baptist University (OBU) in Shawnee, Okla., where her parents had graduated and were married. On the third night of summer school in 1946, she met her future husband, Alvin Morris Hedin. He had just returned from his service in the U.S. Navy during World War II. In the fall, Edna returned to Central College to be a piano instructor on the faculty. On April 1, 1947, Edna and Morris were married. Edna then resumed pursuing her degree in piano performance with a minor in organ and graduated in May 1948. Later in life, she also earned a master’s degree in psychology from Texas Tech University in Lubbock, Texas, in August 1973. After being involved in church music and public education in Oklahoma following their years at OBU, Morris and Edna moved to Artesia. They served 30 years in the public schools and headed the music program at First Baptist Church, where Edna was the organist. Edna spent a lifetime involved in music. Everywhere she lived, she gave private piano and organ lessons. After moving to Roswell upon retirement, she served many churches as a substitute organist and continued to be active in other music activity. Edna taught piano and was chapel organist for New Mexico Military Institute for 16 years. Survivors include sister Margaret Jenks VanHorn of Tulsa, Okla.; stepmother-in-law Dorothy Hedin of Sapulpa, Okla.; sons John Alvin Hedin and wife Rachel of Winston-Salem, N.C., and Edward Morris Hedin of Santa Fe; daughter-in-law Kathy Elana Hedin of Carlsbad; nephew David Moe and wife Donna of Beaverton, Ore.; niece Tama VanHorn of Tulsa; nine grandchildren; and 11 great-grandchildren. She was preceded in death by her husband, Alvin Morris Hedin; son James Lee Hedin; parents Edward Jenks and Tressie Jackson Jenks; and brother Jackson Lee Jenks. In lieu of flowers, the family requests memorial contributions be made to Landsun Homes Helping Hands Fund, 2002 Westridge Rd., Carlsbad, N.M., 88220. Arrangements are under the direction of Denton-Wood Funeral Home. Condolences may be expressed online at dentonwood.com.